Make sure you check out Toxins in Pads and Tampons Part 1 if you missed it. 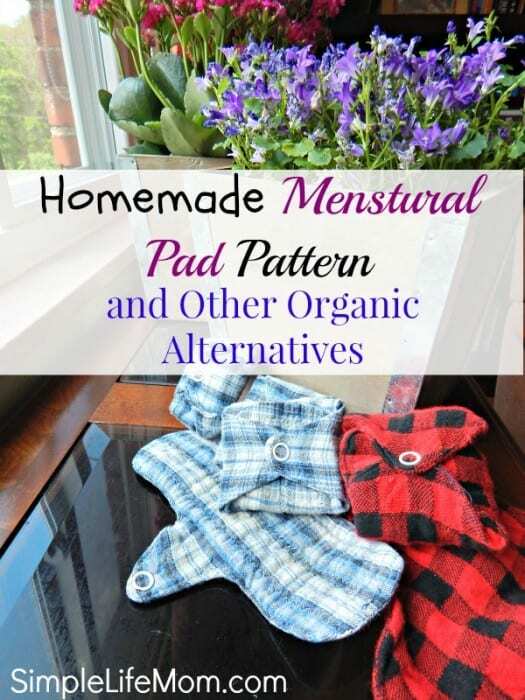 I outline the reasons why we need this Homemade Pad Pattern and Organic Alternatives. 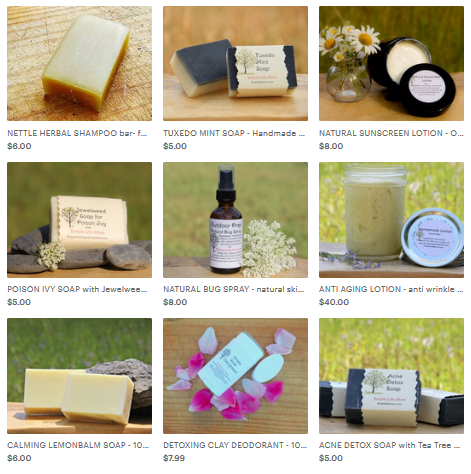 Basically, because of the pesticides used on cotton, the quality of cotton used, the chemicals used to process the pads and tampon materials, glues, plus the chemical fragrances that are added, we come in contact with very harsh toxins that are placed on the most permeable skin on our bodies. Ladies, enough is enough! This should not be, and we should show our frustration with our dollars by making our own products or purchasing from those who are aware of the issue and providing a healthy alternative. This kind of freaked me out when I first heard of it. Yes, stupid of me since tampons are a norm. But anyway, it basically consists of a tiny silicone cup that you fold together, insert, let open and collect menstrual flow. Depending on the rate of your flow, you can leave it in for hours. You then need to empty in into a toilet and rinse it clean, before reusing. It’s that simple. Although everyone I’ve heard use one say that they love it, even they will tell you that they had to adjust or figure it out. Some say they took a couple of months to really get the hang of it, but they all say it is the best thing ever! A reader from the last article said she only felt comfortable after turning it inside out. If you do have some difficulty, consider giving it time and that you possibly need a different size. You can use one over and over again. I’m talking years, ladies. Talk about saving money!!! 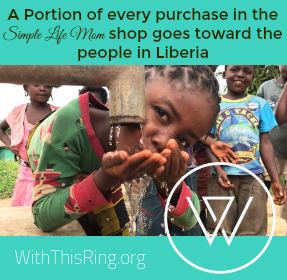 Even if you spend $25 on one cup, you’re saving hundreds and hundreds of dollars per year. There are a number of them out there. They will vary in size and material. There are usually 2 sizes that are determined on how many cm it is to your cervix, but is described as whether you’ve had children or not, or are younger or older. They’re very descriptive to help you pick. The materials used are mostly silicone, though I have heard people say that they have found some made of rubber or TPE (thermoplastic elastomers). Most will also say Phlalate Free, Latex Free, Dioxin Free, and BPA free. Be cautious of these. They may use organic cotton and say that they did not use chlorine to bleach the cotton and did not use fragrances, but what was used to bleach them? What about the glues? I have too many questions to use these. See Toxins in Pads and Tampons for why. There is no frugal aspect. These are expensive. If you cannot stand the thought of washing anything out, then this is a much better option then doing nothing, but I will highly encourage you to try one of the other options as well. Cloth pads are reusable cotton pads that snap around your underwear. You can buy them or make them at variant thicknesses and lengths. My sister-in-law buys hers; I make mine. I love them. They are comfortable and cool. How do you use them? You wear them like a normal pad and then wash it out after use. People do this differently. The easiest in my opinion is to rinse it well and then throw it in the dirty wash and wash it with the rest of your laundry. Another option is to get in the shower with it, step on it as you shower to rinse it out, then throw it in with your laundry – or just finish washing it out. Don’t bleach them! That kind of defeats the entire purpose of switching. Think you’ll have to have a ton of them? Well, everyone that I have talked to that switched from store bought to cotton reusable pads has said that their period shortened in duration and became lighter. If that doesn’t speak to the fact that regular store bought ones are toxic, I don’t know what does. Mine went from horrible 9-10 days in length to 3-4! No kidding!!! My sister-in-law had the same experience. Since then, I’ve read and heard about other women saying the same thing (makes the effort of washing it out well worth it). This option is highly frugal. I have used the same pads for about two years and am just now deciding I may want to make some new ones for myself. And that’s only because they look old and dingy, not because they are not functional any more. First let me tell you that I am no seamstress. I can sew curtains with a crooked stitch, napkins, and other square objects ;-), so believe me when I say that you can do this! Inner Layer Material: Toweling is the best. I used an old bathroom hand towel. Layering: You can cut out as many inner layers as you think you need. I have made five with 1 layer and three with 4 layers that I use at night or heavy days. These eight pads are enough for my use each month, as I will wash them all sometime during that time. Cut one copy around the outer edge for the outer layer. Cut the second copy around the inner edge for the inner layers. Cut out 2 outer layers for each pad and however many inner layers that you desire. Place inner layers on inner side of one outer layer and sew in a zigzag pattern to attach. Place second outer layer underneath the first outer layer (with inner layers on top) and sew around edges only, leaving a space at the bottom so you can turn the whole thing inside out. Once you turn the pad, tuck in the bottom edge and sew shut. Sew down the edges of the inner layers. This prevents it from curling up inside when you wash it. I’ve included a shorter pad and a longer pad pattern. Some women I’ve talked to and shown my pads to have asked for the longer pattern. I prefer the shorter, so choose what you think would work best for you. 1) How often do I need to change it? This obviously depends on how heavy you are bleeding. Don’t get all nervous and layer 6 pads on at once ;-). Instead, try one out when you can get to a bathroom often and see how it goes. Well, if they get really saturated they will, but you’d be surprised how long that actually takes. Here’s the brutal honesty. When you use cloth pads you will be more aware of your body. If you feel that you are bleeding more, go to the bathroom. This keeps your pad cleaner longer. 3) What changes in your body have you noticed? The greatest thing is that I went from a 9-10 day period to 3-4 days – Literally! And I’m not the only one I’ve heard say this. A friend of mine went from 8 days to 5. That’s a wonderful difference!! It’s a testimony to the impact that toxic pads and tampons have on our bodies. What Questions or Insights do you have? Please share with us!! Let me know if you have any questions. I’m going to make more for myself and I’ll include step by step pictures when I do. Can you provide the dimensions of the pattern? When I printed it, it seems quite large, taking up the entire sheet of paper. Just want to confirm this is the correct size. Thanks! Yes, they are 8-1/2 inches long and 9-3/4 inches long based on the seam. But after you fold it right side out you will lose another 1/4 inch. I use the smaller pattern and its perfect. I feel it’s discrete and comfortable. But like I said, a number of ladies asked for a longer pattern, so I provided the longer one as well. Thanks for your post. I’ve made one pad a while back but haven’t gone the whole hog. Do you think it’s necessary to topstitch around the top of the pad. I did on my last pad but it was a bit more work. Also for ladies who have very heavy periods and want extra security you can use PUL (like the one used in cloth diapers) for a waterproof layer on the bottom or polar fleece for a water resistant layer. You don’t have to top stitch all around, but you do need to over the inner layers, otherwise they will fold up on the onside after you wash them. And it’s a pain to try to wriggle them straight each time. I’m a young mom and never would have thought. Wow. Will surely try this pattern. Sew a lot. Thanks. I’m so glad you’re getting this info early on. I was glad to learn so much before my daughters needed it. Such awesome information – I have been debating getting a cup for quite some time. I think having the backup of reusable pads will make the switch easier. Great idea! This is awesome! 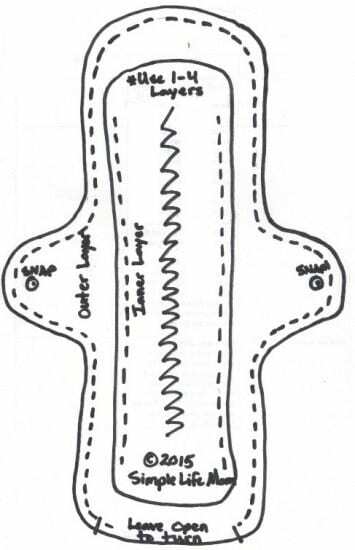 I am going to attempt making my own reusable pads. I’m so excited to make the switch! I found reusable pads on Amazon and started that way. With the weight gain of having to take corticosteroids, it took me a while to find reusable pads big enough for my needs; the initial symmetrical pads I had purchased weren’t long enough for me after the weight gain. Finally, still on Amazon, I found a style & length that work for me, and I will not go back to disposables. 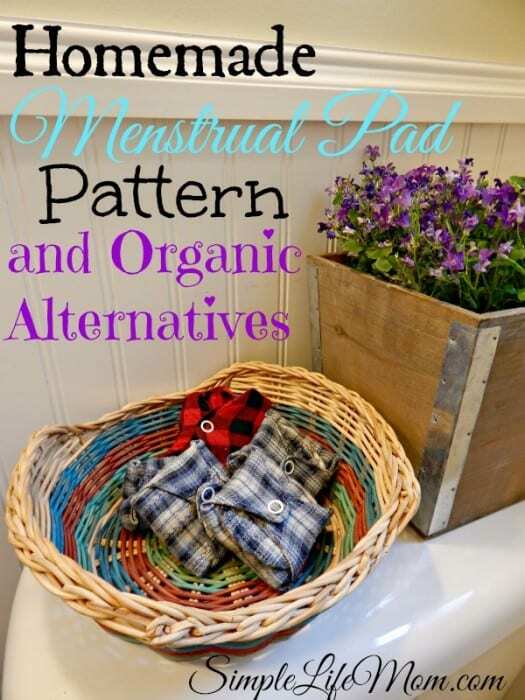 I am chronically ill & spent most of 2018 in bed, however, I still started using the new style & size mid-year and using reusable pads was still doable for me! I, too, went from bleeding and needing pads for about 7 days down to only THREE DAYS of needing a reusable pad! I have light spotting for 2-3 days, but it doesn’t require any liners. It did take several months, but the decrease started immediately. I have already used my money’s worth, and the pads are still in great condition. On a similar topic, I have also switched to cloth hankies. It is pretty much insane how much disposable feminine hygiene products and facial tissues and paper towels cost! Even with having chronic sinus problems, I am very happy to be making these changes for health and financial reasons.